Preparing for the Program Matching Feature – How can we help you? Before getting started, review the requirements for your unique programs. Up to 20 Common Application Questions can be added to the questionnaire with a minimum of one question being required. Consider the most common requirements. Questions may need to be added to your common application, such as "Major Field of Study," "College/University Attending," "GPA," "Graduating High School," etc. All questions added to the matching questionnaire must be multiple choice or validated text. 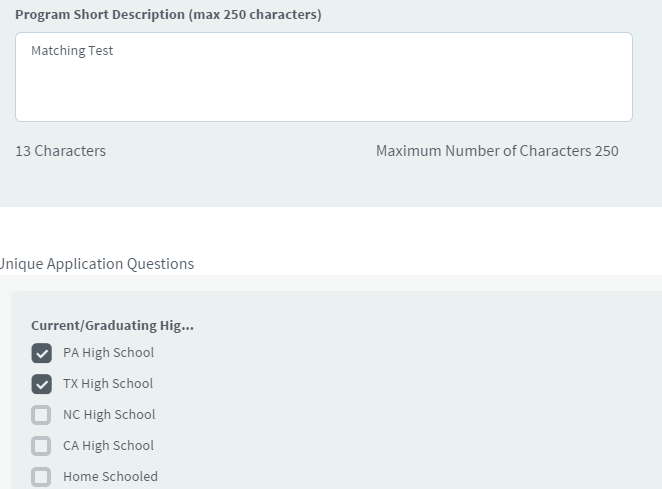 If you have questions such as "High School" or "College/University Attending," you can add a list of the high schools in your community or a list of your preferred colleges and make the question type "Multiple Choice - Only One Answer." If you have a question such as "Major Field of Study" where the applicant may need to choose more than one, add a list of fields of study being sure to add those which are listed in program requirements and make the question type "Multiple Choice - Multiple Answers." For a question such as "GPA," you must make sure the answer is validated. To do this, edit the "GPA" question so that it is the "Number" question type and select the number of decimal places for which you want to allow. This is typically 2 decimal places. Since GPAs are requested to be on a 4.0 scale, therefore it is usually recommended to set the validation range to be 0.0 to 4.0. If you need a list of common fields of study, careers, or languages, please submit a request for the list to Support.